This is a follow-up to my initial blog post how to extend the SalesTable2Line Framework from 2011. 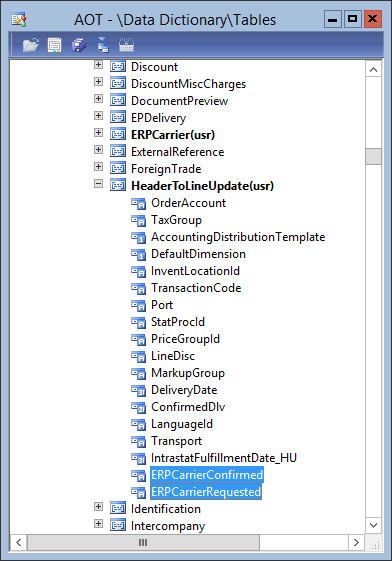 However, this post is a walkthrough how to update PurchLine fields from the PurchTable header. Create an extended datatype called ERPCarrier which extends the Name datatype. Provide a label called Carrier.On the PurchLine create two new fields called ERPCarrierRequested and ERPCarrierConfirmed based on the datatype ERPCarrier. Provide two meaningful labels, Requested Carrier and Confirmed Carrier. Create a field group called ERPCarrier and add both fields to the group. On the PurchTable add two new fields called ERPCarrierRequested and ERPCarrierConfirmed based on the datatype ERPCarrier. Provide the same labels as on the PurchLine. Create a field group called ERPCarrier and add both fields to the group. Moreover, add both fields to the field group HeaderToLineUpdate! 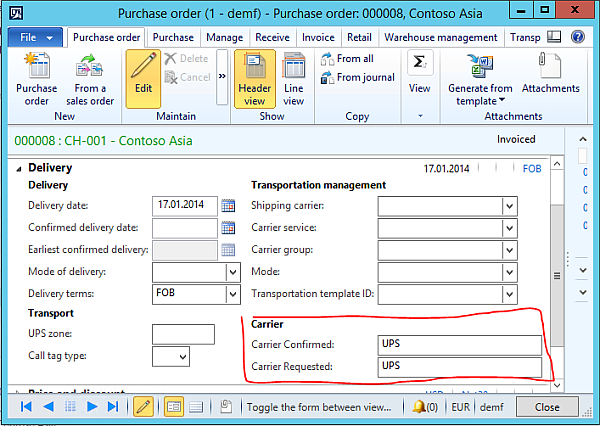 On the PurchTable form, add the PurchTable field group ERPCarrier in the header view in the group delivery. Add the PurchLine field group ERPCarrier in the line view in the tab delivery. On the AxPurchLine class add a new static method which is used to set the new fields. 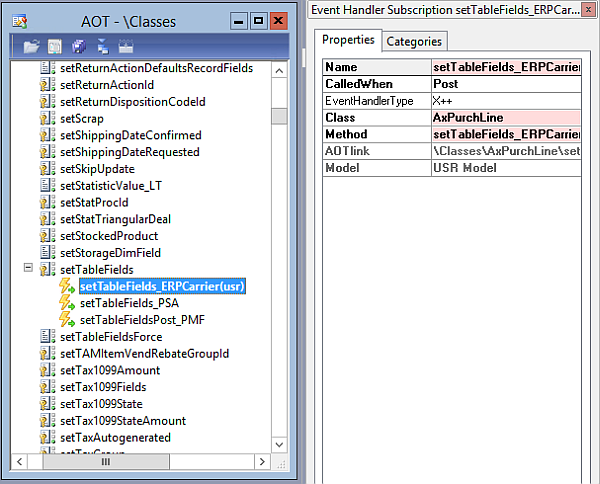 On the AxPurchLine class, go to the setTableFields method and expand the event handler. Add a new Post X++ event handler. Provide the AxPurchLine as class for the event handler and the newly created method setTableFields_ERPCarrier as event handler method. On the PurchTable2LineField class, open the getFieldDescription method and scoll down. Add the following code to handle the two fields. Compile your code an build incremental IL. 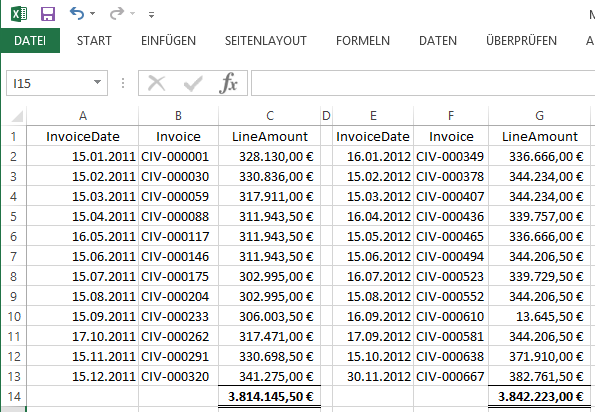 Open the table PurchTable2LineParameters and delete all records. Restart the AOS to make sure no cached version is used. In AX go to Accounts Payable > Settings > Parameter > Tab Updates and click the button “Update order lines”. 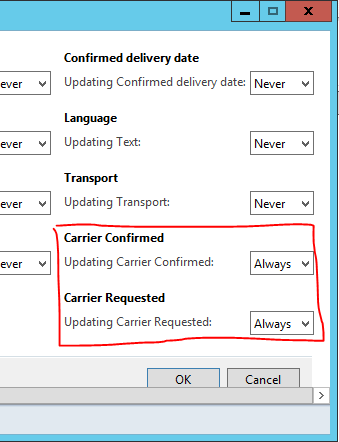 Set the Update Requested Carrier and Confirmed Carrier to Always. 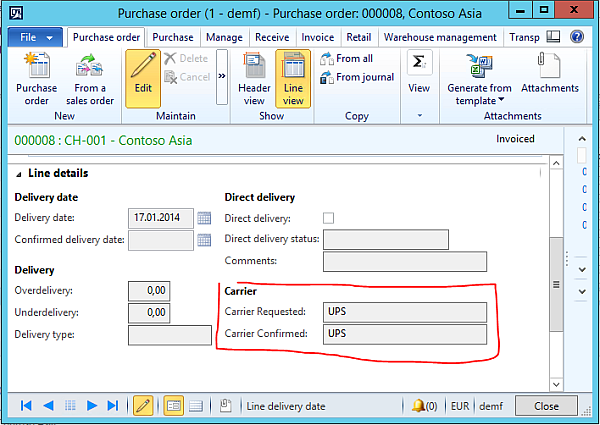 Open a purchase order in AX and edit the purchase header. Provide a requested carrier e.g. UPS and a confirmed carrier e.g. DHL. Save your changes. Check if the values from the header have been copied to the purchase lines. At work we’ve recently discussed how to calculate a customers invoice amount for multiple years. One idea was to loop over the customer accounts (while select) and individually calculate the sum for each year with individual statements (select sum). However, this can be done by a single statement. With Dynamics AX you can attach document references like Word files, Excel sheets, mail, fax and notes to any displayed record. The icon to do so can be found in the forms toolbar. Unfortunately it’s hard to discover if a document is attached to a record. Therefore it’s helpful to display an icon in the overview grid to indicate attached documents. Create a new Integer extended data type called DocuRefIcon and label it with Documents (@SYS124737). Set the help text to Document Handling (@SYS22623). Add a display method showDocuRefIcon() to the CustTable. 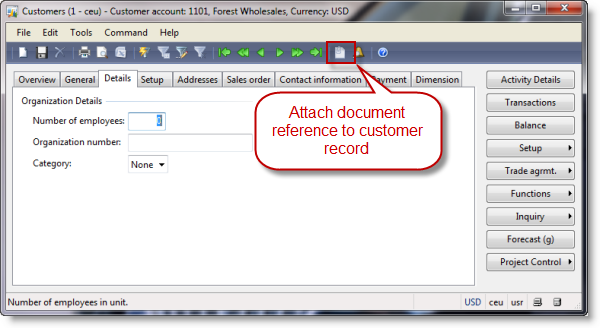 Document references use a RefTableId and RefRecId to reference any record in Dynamics. If there is a document reference for the current CustTable record return resource id 3028 otherwise return id 0. Open the CustTable form and a new icon to the Overview grid. Set width and height properties to 16. 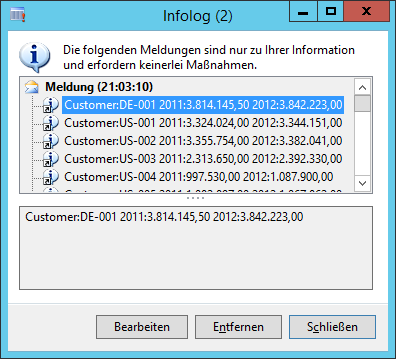 Set CustTable as datasource and showDocuRefIcon as data method. Save and open the form. Attach a document reference to a customer and you’ll see a notes icon in the new grid column.